It’s no secret that Boston is one of the best cities to lace up your sneakers and hit the ground running. The city has been named the third best running city in America by Runners World, and there are plenty of reasons to back up the claim. We don’t have to convince you to get outside and start tracking your mileage, because you’re most likely already doing it—with hopeful Boston Marathon dreams down the pipeline. But if you’re traveling to our beloved city, or just need a change of scenery, mapping out a new route isn’t always the easiest, and may lead to some extra miles you weren’t particularly planning on adding to your after-work run. 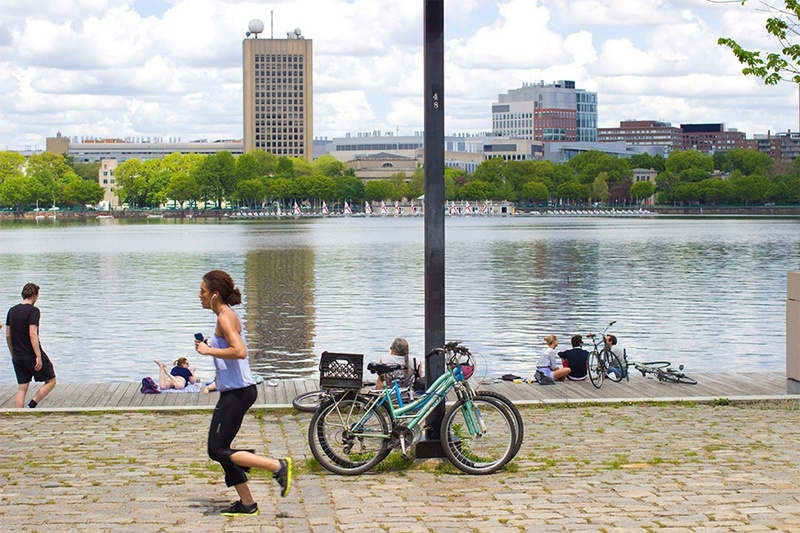 We’ve taken it upon ourselves to provide you a breakdown of some of Boston’s best routes, by distance, so whether you’re looking for a 5k or a 20k, you’ll know just how far to run. Easily accessible on the Green Line. Hop off at Cleveland Circle and take this paved 1.5-mile loop around the reservoir with views of Boston College and the skyline. Starting from the northern end of the Common and finishing at the very end of Commonwealth Avenue Mall, a straight shot will get you 1.5-miles on the books. Perfect for when you’re too busy to get out to the trails on the outskirts of the city but want to enjoy some green spaces. Access the Common at Park Street or Boylston on the Red or Green Lines. If you want to start from the other direction, get off at Hynes on the Green Line. The largest standing body of water in the Emerald Necklace, the pond, located in Jamaica Plain on the border of Brookline, provides a peaceful 1.5 mile loop. It was formerly used as a source of ice and is now home to many outdoor activities. If you don’t already live in Jamaica Plain, add an extra mile to your route by taking the Orange Line to Stony Brook and running along Boylston to Moraine Street before making your way to the park. This little oasis of green space enclosing the Fenway Victory Gardens makes a very manageable 1.5 mile loop within easy walking distance from Fenway or Back Bay and a short hop, skip, and jump from the Hynes and Northeastern stops on the Green Line. The primary path around the park features a lake and some shaded stretches with views of the zoo and golf course. Hop off the Orange Line at Forest Hills for easy access. On the other side of the river, take this more secluded loop in Cambridge. If you’re not from the area, your best bet will be to take the Red Line to Alewife and add a mile to your trip there and back. Run this loop around the bustling arboretum for views of the skyline and a plethora of different plants. Get off the Orange Line at Forest Hills for the most direct shot. Take your pick on the Esplanade by picking two bridges and forming a loop. The most storied of them will be the Harvard and Longfellow bridges. Watch boats, ducks, and duck boats, and run in good company with many others along the river. Split this up to make for a manageable loop, but if you’re looking for the best views along the water, take it the whole way from Charlestown through the North End and to the Seaport and experience the waterfront in all its glory. Running along the Charles is about as synonymous to Boston as lobster rolls and great sports teams, and you’ll always be in good company. For the best views of the river and the city and a pretty doable mid-week run, take the loop between Harvard Bridge and River Street Bridge. If you want to easily double your mileage, start at the Museum of Science Bridge and head to the Anderson Foot Bridge for a full loop of the Charles. Follow this four mile stretch one way along the Orange Line from Back Bay to Forest Hills, connecting the South End, Roxbury, and Jamaica Plain, ending at the Arnold Arboretum and Franklin Park (additional mileage opportunities!). With 11 playgrounds, two spray pools, seven basketball courts, five tennis courts, two street hockey rinks, and two amphitheaters, you won’t have any shortage of things to look at. Either turn around and head back for an 8-miler or hop on the Orange Line home. Start at the Museum of Fine Arts and follow the Emerald Necklace all the way to Jamaica Pond, turning around at Perkins Street for a beautiful 5 mile loop through the greenery on the edge of the city. If you’re really looking for some secluded trail running but don’t have time to take an hour trip all the way out of the city, hop on the Orange Line up to Malden Center or Oak Grove and take a seven minute Uber to the trailhead for the Skyline Trail at Middlesex Fells Reservoir. Start the trail leading to the left so you can enjoy views of the skyline when you’re finished. Be warned: The trail is very rocky, lined with roots, and a big portion of it is uphill, so if you’re looking for a challenge, this one’s a good pick. From Castle Island, run along the beaches at Pleasure Bay until you get to JFK Library/UMass and turn around for a 7.8-mile loop on South Boston’s shore.Turn around at Carson Beach for a shorter 4.8 mile loop. When you’re done, post up on the beach with a towel and take a dip in the bay. Not ready to tackle a full marathon yet, but think you have the chops to conquer Heartbreak Hill? Hop on the D Green Line and get off at the Waban Stop in Newton and run the last 10 miles of the Boston Marathon route. Pass through Boston College and Fenway and then make your way into Back Bay, stopping on Boylston. Access the Somerville Community Path from the Red Line at Davis Square and take the path for two miles until you hit the historic Minuteman Bikeway, which stretches for 10 miles to the Bedford Depot along the path where the American Revolution started. If you want to bypass the path, take the Red Line to Alewife Station. If you make the one way trip all the way to Bedford, hop on the 62 bus back. Follow the Charles as far as you can (kinda) from the Science Museum bridge to Mt. Auburn Street, and loop around and follow the river all the way back for a long marathon training run. If you’re feeling the burn, turn around at any of the bridges you pass for a shorter loop. From Charlestown all the way down the coast to the Neponset River Greenway, this near-continuous 43-mile stretch offers runners plenty of opportunities to log longer runs. Hit the Freedom Trail in the North End and run along the coast to the Seaport or reach the Emerald Necklace and the Esplanade for even more running route opportunities. Because the Boston Harborwalk is so extensive, we haven’t included it in our map, but you can access it via Boston Harbor Now’s website here. Did we overlook your favorite route, and you think it needs to be included? Let us know.